Unfortunately many organizations today are losing the race against the hacker community by a large margin. As noted in the Verizon 2016 Data Breach Investigation Report, the percent of compromises that transpired in “days or less” has risen from 67% to 84% over the last 10 years. Over this same time period, the percent of compromise discoveries that occurred in “days or less” also improved, but not enough to narrow the time gap between compromise and discovery. In other words, the bad guys are accelerating their exploits faster than the good guys are accelerating their ability to discover. The path to narrowing the time gap between compromise and discovery, and then neutralizing business-impacting incidents, is through a comprehensive and mission-oriented Security Information and Event Management (SIEM). A well-designed SIEM not only advances security objectives, but it also works to direct personnel and process for maximum impact. With limited resources and a rising number of attacks, not all solutions are created equal. You need to ensure they are getting the best bang for your buck. 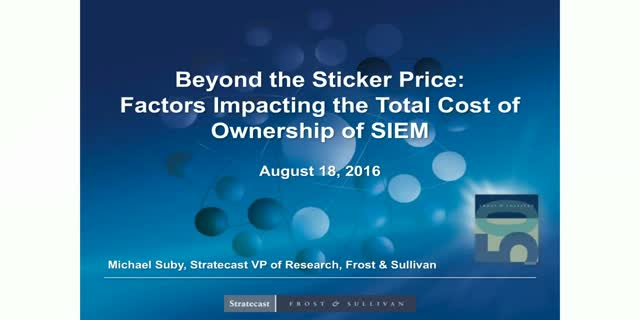 In this webinar, Michael Suby, vice president of research at the global research and consulting organization Frost & Sullivan, will discuss the factors that contribute to SIEM’s total cost of ownership. If your team still heavily relies on manual processes or struggles with a lack of skilled resources, tools, and budget, then automation and integration could be the answer to improve your security operations. Automation of everyday security operations will simplify and streamline your teams’ workflow and allow them to put their skills to better use on more complex tasks. Despite the benefits, 59 percent of SANS survey respondents still use little to no automation of key security and incident response (IR) tasks. Why have organizations been slow to embrace automation? In this webcast series, Emily Laufer, product marketing manager at LogRhythm, and several industry experts come together to discuss the new SANS survey findings on automation and integration. They’ll discuss what holds most organizations back from automating more security processes and provide advice on the step’s teams can take to overcome automation challenges and realize its benefits. Watch now to learn how automation can bring your team, process, and technology together to move your security operations forward. In this webcast, we take an actual real-world example of a SIEM (in this case LogRhythm), and an IAM (Okta), and demonstrate how their integration matures an organization’s security posture. Randy Franklin Smith (of UWS) and Greg Foss (LogRhythm) dive into how Security Analysts can make more informed decisions and perform better investigations when they have a full picture of IAM events spanning on-prem and cloud-based activity — and how organizations can respond rapidly to security alarms with automatic protective measures. Greg Foss is a recognized security expert who created LogRhythm Invoke-Okta, a bidirectional integration framework that provides for easy interaction and automation with Okta and the LogRhythm SIEM. MITRE ATT&CK is a knowledge base and framework that lists and details adversary tactics and techniques within a common taxonomy. Having a taxonomy by itself has many valuable uses, such as providing a common vocabulary for exchanging information with others in the security community. But it also serves as a real technical framework for classifying your current detection efforts and identifying gaps where you are blind to certain types of attack behaviors. - Share various ways to use ATT&CK, specifically in relation to designing, enhancing, assessing, and maintaining your security monitoring efforts. - Discuss LogRhythm Labs’ project that includes aligning the ATT&CK matrix with log sources. - Walk through an example of the MITRE attack process from start to finish while focusing on rule development and alignment in the LogRhythm NextGen SIEM Platform. Brian Coulson, from LogRhythm Labs, is leading an outstanding project at LogRhythm Labs where-in he will show you how they’re aligning the ATT&CK matrix with log sources, including windows event logs (XML – Security, XML Sysmon 8.0 and XML-System). While the matrix is wide spread in what it monitors, there are effective ways to filter around common and relevant detection techniques and logs. Too often, when looking for malicious network traffic you either search for known bad or investigate anomalous traffic that doesn’t look normal. That reactive approach is time consuming, and potentially over-reliant on searching for larger concerns. Fortunately, new solutions use advanced analytics to proactively identify, enrich and alert on malicious traffic. **Detecting anomalous traffic can address the aforementioned weaknesses, but in practice it depends heavily on how – and how well – you define anomalous traffic, and how quickly (accurately) you can spot it. In this real training for free event, we will explore how to analyze your network so that you can learn and understand its traffic patterns and get a handle for what’s normal. You’ll then be able to take this information and look for anomalous traffic, build known-bad detections and make your network detection and response (NDR) technologies and efforts smarter. Email security continues to be a central concern for organizations as they advance their security posture and reduce risk. Between password leaks, brute force attacks and phishing, email credentials and actual email sends continue to be at jeopardy. Of further concern is that missing the initial compromise – often via email platforms – can enable the attacker to collect data and move laterally into more valuable environments. In this webinar, Susana Hernansanz and Sam Straka – both Technical Product Managers at LogRhythm - will highlight the value of ingesting and monitoring O365 logs via your NextGen SIEM. With LogRhythm the data will be enriched, normalized and contextualized for efficient use in threat hunting and alarms. There’s no question about it: Legacy SIEMs hinder your ability to achieve your security objectives. Traditional solutions are limited and often lack the flexibility to scale and grow as your security needs increase. To combat today’s threats, you need a next-gen SIEM that leverages the architecture and security capabilities that are best suited to detect both known and unknown threats within your environment. But what makes a SIEM “next-gen”? And how do you know if the SIEM technology you’re looking at possesses these requirements? In this on-demand webcast, Christopher Crowley, senior instructor at SANS, and Barbara Filkins, senior analyst at SANS, join Sara Kingsley, senior product marketing manager at LogRhythm, to explain what comprises a modern SIEM solution and share tips for evaluating a next-gen SIEM platform. Watch the webcast now to get the tools you need to evaluate and choose a next-gen SIEM that fits the needs of your organization’s requirements. In this real training for free session, we will discuss the minimum toolset and data requirements (and not necessarily volume) you need for successful threat hunting. We will take into account that while some of you can devote most of your time to threat hunting, most of us have limited time and resources for this activity. The good news is that threat hunting is flexible and anyone can do it, ranging from a few hours a week to full-time. As just one example, a great type of threat hunting is to look for unrecognized/suspicious executables running on you network. You can dip your toe in the water with this type of hunt with a small commitment of time and resources or you can plunge in deep with a major data collection and analysis effort. Starting out simple means you just focus on EXE names; baseline the EXE names being executed on your network, and then perform a daily review of new EXE names showing up for the first time. You can get this information from event ID 4688 and the query capabilities are very light. But I think you’ll be surprised what you are able to learn and catch. LogRhythm is sponsoring this real training for free event and Nathan Quist (aka “Q”) is helping me on this event. Q is LogRythm’s Threat Research Engineer and works with LogRhythm’s internal SOC team and its clients to perform deep dives into their environments to uncover threats facing our industry. LogRhythm and Cisco are committed to helping you enhance your security operations through the seamless integration and powerful capabilities of the LogRhythm Threat Lifecycle Management platform and Cisco’s Threat Grid, Umbrella, Firepower and ISE. Currently integrating with over three dozen Cisco products, LogRhythm provides centralized visibility and advanced security analytics across the Cisco-enabled environment and makes security events actionable in the network. Stay in front of cyber adversaries and proactively detect, respond to and remediate cyberthreats with this powerful integration. One of the common complaints I hear from security professionals is, “I don’t have the budget for that.” Do you know many of the tools that can solve problems in the enterprise are free, as in free beer? You don’t have to buy commercial products to secure your entire enterprise. Sure, there are some areas that do require a PO, however, there are also several areas of your security program that can be implemented using free and/or open source tools. Steve Kaufman, a Technical Product Manager from LogRhythm, will be joining the webinar to cover how security technology vendors are aligning with open source tools. He’ll explore how LogRhythm’s architecture, including elasticsearch, enables the product to integrate with open source tools. DNS is woven into the fabric of both the Internet and corporate intranets. It works so well that you might even forget it exists—until it is used against you. Hackers are using DNS to find Command and control (C2) servers, control compromised systems, and exfiltrate your data. In this free training webinar, a group of security experts from LogRhythm and Ultimate Windows Security team up to show you how to spot threatening DNS activity with LogRhythm NetMon Freemium. Watch now to learn how to stop hackers from exploiting DNS to infiltrate your network. The rapid development and adoption of cloud infrastructure, mobile workforces, IoT and other susceptible environments has mandated a reappraisal of security architecture. Modern organizations are recognizing their security posture may not be keeping up with the threat landscape, and this leads to frightening discoveries around the safety of their data and networks. In this webinar, Erik Bartholomy – a Security Architect at LogRhythm – will be joined by Eric Parent – CISO at Sonepar – to discuss how security architecture is developing to face the current threat landscape. Failures in past layered approaches are frequent, and serve as valuable learning lessons on the importance of proactive monitoring and response. As the value of patient records, infrastructure, and services grows, the health care industry continues to become a major target for cyberattacks With an expanding attack surface — due to cloud infrastructure — it's critical this vulnerable industry continues to mature its security capabilities for its most valuable data and apps. Epic Systems is a market-leading Electronic Health Records (EHR) vendor widely used by large hospitals and health systems to access, organize, store, and share patient medical records. Given the volume and sensitivity of personal data on Epic platforms, it’s critical to ensure threats to patient privacy are detected and mitigated quickly. If you have Epic and LogRhythm, this is a must-see webinar. If you use another EHR, use the information from this webinar as a template on how and why to monitor your EHR platform. User and entity behavior analytics (UEBA) and security information and event management (SIEM) are separate security solutions that can work together to detect shifts in behavior that indicate a compromise is occurring. UEBA is enhanced by leveraging the data collected and enriched by a SIEM, and SIEM capabilities are expanded by ingesting UEBA events for further correlation. One of the best ways to understand this symbiotic relationship is to take an actual source of security events and apply UEBA to it. In this on-demand webcast, Matt Willems, LogRhythm’s technical product manager, joins Ultimate Window Security’s Randy Franklin Smith to uncover the relationship between UEBA and SIEM — giving you an inside view of user behavior analysis in action. The webcast identifies the most important events from the Windows Security Log for UEBA and the roles that generate them, as well as challenges in correlation. In addition, you’ll learn about alternative logs that augment user behavior analysis. Watch the webcast to learn how to successfully apply UEBA to security events. Efficient threat hunting can help you better allocate your security resources so your team can focus on the threats that matter. In this on-demand webcast, Andrew Costis, LogRhythm threat research engineer, joins the Security Weekly team to explain how you can properly utilize your arsenal of defensive tools to hunt for threats. Watch the webcast now to learn how to implement threat hunting into your security operations. Today’s organizations must face increasingly frequent and complex cyberthreats. Protecting your organization now requires effective Threat Lifecycle Management (TLM) to address threats across your IT environment. The LogRhythm TLM framework enables you to guard, monitor, and search for threats across your network. This results in a faster time to detect and respond to cyberthreats, increasing your organization’s security. In this webinar, Jake Reynolds, LogRhythm Technology Alliances Engineer, will highlight how LogRhythm’s Threat Lifecycle Management Platform integrates with Palo Alto Networks’ Next-Generation Security Platform. Together, these tools provide deep network visibility, empowering your security operations team to quickly discover and neutralize concerning incidents. Watch the webinar to learn how LogRhythm and Palo Alto are empowering organizations to detect, respond to, and neutralize cyberthreats. Security mature organizations are increasingly utilizing User and Entity Behavior Analytics (UEBA) to quickly surface, prioritize, and respond to anomalous and alarming user behavior. Join Stephen Frank, director of technology & security at National Hockey League Players' Association (NHLPA), and Matt Willems, LogRhythm senior technical product manager, as they discuss how to apply UEBA to meet security use cases. The duo will outline NHLPA’s key use cases and how LogRhythm is supporting their security initiatives. Register now to get an inside look at how NHLPA is working with LogRhythm to enhance their UEBA capabilities. LogRhythm UEBA solutions uncover user-based threats with diverse analytical methods, including scenario- and behavior-based techniques, which deliver comprehensive visibility across the full spectrum of attacks. LogRhythm can help maximize efficiency and minimize risk, to help you solve security use cases such as insider threats, account compromise, privileged account abuse, and more. Watch our on-demand technical demo highlighting the power of our UEBA solutions. When threats occur, understaffed security operations centers (SOCs) lack sufficient access to contextual information. This lack of visibility is a key problem that LogRhythm CloudAI for User and Entity Behavior Analytics (UEBA) are designed to solve. In this webcast, Dave Shackleford, senior SANS instructor, and analyst, joins Seth Goldhammer, LogRhythm senior director of product management, to explore how CloudAI uses supervised and unsupervised learning to establish baselines and monitor user behavior. Shackleford reviews LogRhythm CloudAI and he runs through various use cases, such as insider threat, account compromise, and admin abuse. Watch the webcast now to understand how LogRhythm CloudAI can help you detect dangerous user behavior and rapidly mitigate threats. Today’s hackers often favor the phishing email as their weapon of choice. Phishing attacks are not only common, but are also very difficult to defend against. What if you could detect and mitigate a phishing attack before its intended target clicks on that fatal link or opens that malicious attachment? When your Exchange server is in the Office 365 cloud, solutions such as constant inbox scanning or relying on synchronous mail flow aren’t viable options. Instead, you can find a strong defense against phishing emails in the Message Tracking log in Exchange. The Message Tracking log is available in both on-prem Exchange and Office 365 Cloud’s Exchange Online. Message Tracking logs include valuable information about the client, servers, sender, recipients, message subject, and more. If you can access this information and know how to mine it, you can detect likely phishing emails. - To optimize your phishing response efficiency, LogRhythm has introduced a new open-source Phishing Intelligence Engine (PIE). PIE is a PowerShell framework focused on phishing attack detection and response. Register for the webinar now to learn how you can use LogRhythm’s PIE and Office 365 to better detect and respond to phishing attacks. LogRhythm, the leader in security intelligence and analytics, empowers organizations around the globe to rapidly detect, respond to and neutralize damaging cyber threats. Subscribe now to learn about today's evolving threat landscape, the hottest enterprise security topics and how LogRhythm's Security Intelligence Platform can keep you one step ahead of cyber criminals.